What Is Ning and Is It Worth Using? Ning is a social network that allows users to create their own personalized social networks. It's social network inception! First launched in October of 2005, Ning is currently the largest SaaS platform that aims to help business or brand-minded users develop a website that operates as a social network with community management features and social media integration. The platform also offers ecommerce solutions so users can make money from their communities. Ning helps users get started with creating their own social networks by leading them through a series of easy steps that include naming their social network, selecting a color scheme, allowing for unique profile questions and even including their own ads if they want them. Ning sites are built to be extremely fast and come with advanced features plus in-depth analytics. If you're already connected to everyone on existing social networks like Facebook, Twitter, and others, then why should you even consider bringing a whole new one into the picture by joining Ning? It's certainly a question worth asking. Put simply, it's the level of control and customization you get that sets it apart from the big social networks everyone uses already. You can go ahead and set up a Facebook group or start a Twitter chat, but this means that you also have to play by Facebook and Twitter's rules. In addition to gaining more control over your Ning network, you also get all the tools and expertise you need to nurture it and watch it grow. Ning claims to have helped people build online communities with over one million members plus tens of millions of combined page views. Ning can be used to create a fan site for your music, a place for discussion for a nonprofit organization in your community, a platform to sell access to your content or anything else you want. The open-ended nature of Ning makes the possibilities limited only by your own imagination. So, your own social network might sound pretty good. But how about some details, huh? Here's what you get. Community features: Build your own forum, allow users to post photos, and even include a "liking" feature similar to Facebook! Social integration: Allow your users to sign in through an existing social networking account, integrate video sharing platforms like YouTube or Vimeo and enjoy seamless social sharing across all other popular social networks. Email broadcasting: Keep in touch with your community in the most intimate way possible—email! This saves you the time and money it would take to work with a different email list management service. Mobile optimization: Access your social network from mobile devices thanks to its responsive design, and even develop your own optional app using APIs. 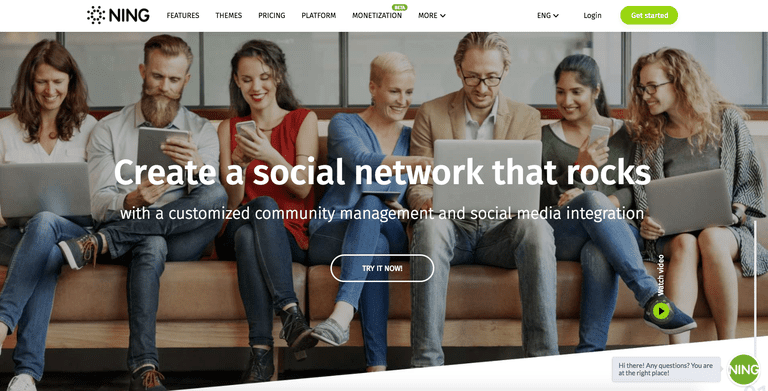 Customizable options: Build the exact look you want for your social network with its intuitive drag-and-drop feature, add your own custom code if you want, and even connect it all up to your own domain name. Privacy & moderation: Ensure every user has control over their level of privacy, appoint option administrators, moderate content and control spam. Monetization: Enable paid membership access options to your platform, collect donations or accept payment in exchange for content. Ning isn't the type of platform you'd use for personal reasons. If all you're wanting to do is get a community together with as little investment as possible, then sticking to a Facebook group or page is probably best. You can get a 14-day free trial of Ning, but after that you'll be asked to upgrade to one of three different plans—the cheapest of which is the Basic plan at $25 a month. Ning is truly a marketer's tool, which is why it costs so much to use and is ideal for businesses and brand builders. What Exactly Is Last.fm, Anyway? What is a Web Series?